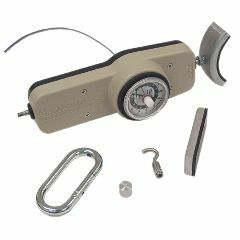 AllegroMedical.com presents The Baseline® Mmt - Hydraulic - Includes 3 Push, 2 Pull Attachments - 500 Lb. Capacity Dial Gauge And Analog Output Signal. The Baseline® hydraulic push-pull dynamometer is perfect for muscle strength measurement, job task analysis and functional capacity evaluation (FCE). The dynamometer is lightweight and portable. The dynamometer is packaged with 3 push pads (padded curved, padded straight, and circular), 1 pull hook and 1 snap-lock hook. Can be used with lift platform (sold separately) to conduct muscle strength and functional capacity tests. Compatible with Baseline® single and dual grip handles (sold separately). Comes in a cushioned carrying case with a muscle test manual. 1 year warranty. CE certified. The Baseline® hydraulic push-pull dynamometer has a 500 pound capacity, dial gauge and an analog output signal carrying pressure reading. Dynamometer is perfect for muscle strength measurement, job task analysis and functional capacity evaluation (FCE). The dynamometer is lightweight and portable. The dynamometer is packaged with 3 push pads (padded curved, padded straight, and circular), 1 pull hook and 1 snap-lock hook. Can be used with lift platform (sold separately) to conduct muscle strength and functional capacity tests. Compatible with Baseline® single and dual grip handles (sold separately). The strength reading can be viewed as pounds or kilograms. CE Certified. Comes in a protective carrying case.